I found this lump of a gray rock in southeastern Indiana along a highway near the town of Liberty. 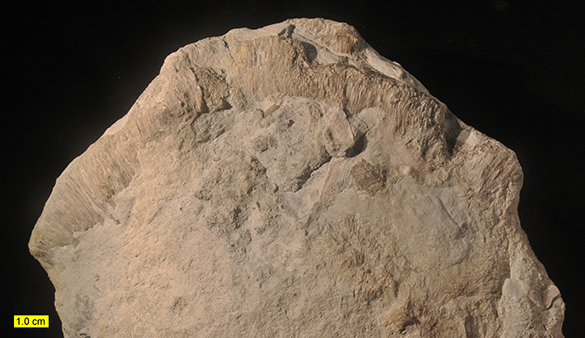 It is from the Saluda Formation (Upper Ordovician), a thin unit that was likely deposited in very shallow, lagoonal waters along the Cincinnati Arch. It is not especially notable in this view. 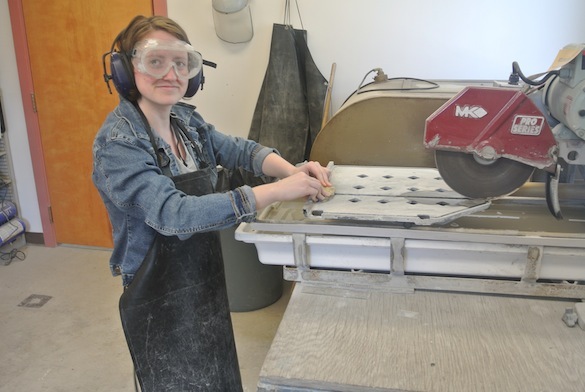 I intend to show you the wonders that can be revealed in such dull rocks by simply sawing them in half. First, though, let’s have a look at the outside. 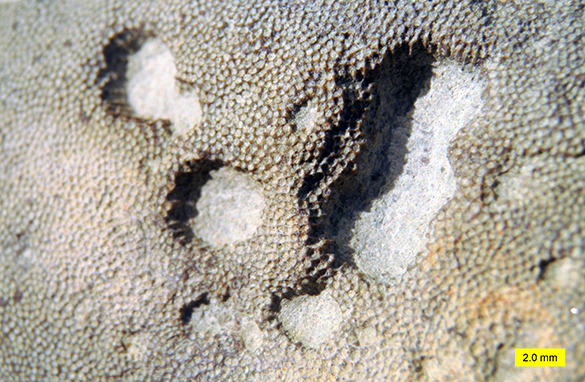 Inn the view above you can see on the left side a large trepostome bryozoan with some irregular holes in it. We’ll come back to that. Flipping the rock over we find that most of it is a fibrous fossil shaped like a dinner plate with limestone matrix and encrusting bryozoans covering most of the center. A closer view of the fibrous part shows thousands of thin tubes radiating out from the center of the plate. 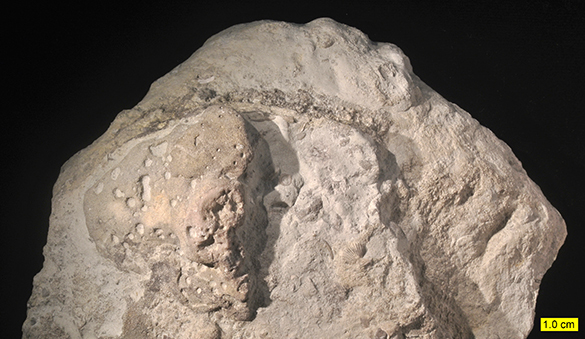 This is the Ordovician fossil known as Tetradium. It is strange and mysterious enough that we will use the next Fossil of the Week blog post to describe it. It has been called a chaetetid sponge (as in Termier and Termier, 1980); a “calcareous filamentous florideophyte alga” (Steele-Petrovich 2009a, 2009b, 2011; she renamed it Prismostylus), and most commonly a coral of some sort (Wendt, 1989). Interesting range of options! We’ll explore later. Now, back to the trepostome bryozoan visible on the top surface. There are three kinds of holes on this specimen. The smallest are the zooecia of the bryozoan itself, each of which would have hosted a zooid (a bryozoan individual). They are the background texture of the fossil. The large holes above are a bioclaustration structure that Time Palmer and I named in 1988 as Catellocaula vallata (little chain of walled pits). It is explained thoroughly in one of the early Fossil of the Week posts. Basically they are pits formed when the bryozoan grew up and around some sort of soft-bodied colonial organism sitting on top of the surface, forming these embedment structures connected together by tunnels at their bases. 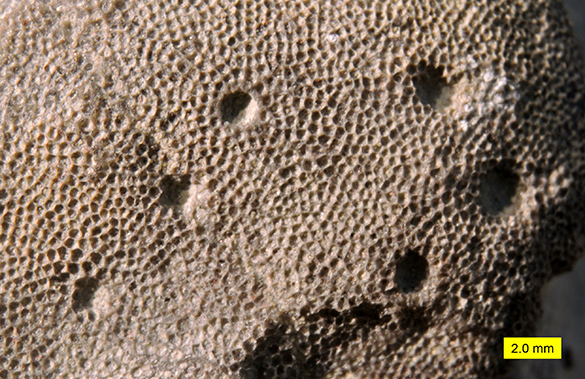 A third kind of hole in this bryozoan is a boring cut down into its skeleton. These are the trace fossil Trypanites, formed when some kind of filter-feeding worm bored straight into the calcite zoarium (colonial skeleton) to make a protective home, as many polychaete worms do today. Inside we find a wonderful cavern of crystals — a geode! The crystals are mostly calcite, with dog-tooth spar lining the cavity and blocky spar replacing large parts of the Tetradium skeleton. There’s a story here, and it will be told in the next Fossil of the Week post!